This is a sponsored post written by me on behalf of Johnson & Johnson and iHerb.com. All thoughts and opinions are 100% my own. When Ryan was a baby I read a lot about bedtime routine since he was a terrible sleeper. I hoped that creating one would help him fall asleep easier, sleep longer, and just make life easier in general. A strict bedtime routine was simply NOT for us. Ryan seemed to despise the idea and would actually start to freak out and get angry once he realized what was happening – the kid hates bed time, so a set of steps he could essentially countdown to his most hated time of day was stressful for both of us. So we just went with it and let it be. Sometimes bedtime was a hassle, sometimes it was simple, but to be honest I think that that’s just how parenting goes. Win some, lose some. In time, we created our own low-key bedtime routine that was stress-free but also helped reduce some of the arguments about what time it was. This isn’t to say that every single night Ryan hops into bed with a wave and a smile, but it’s definitely an easier process. 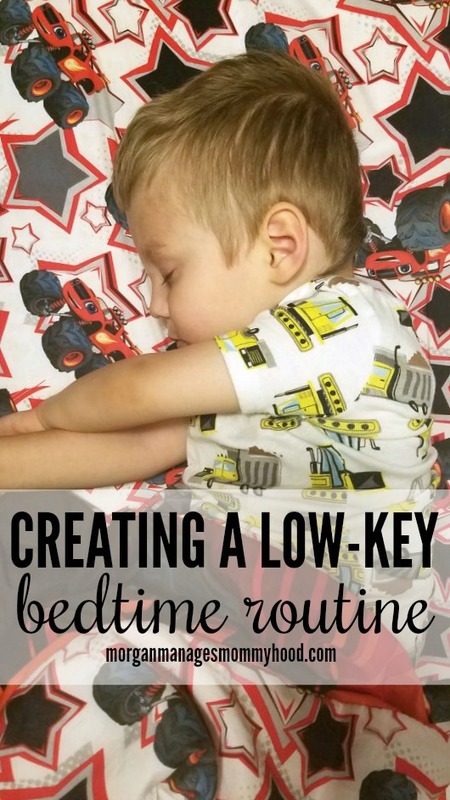 Today I’m sharing my keys to creating your own low-key bedtime routine for you mommas who struggle with stubborn kids who could stay up all night if you let them. Don’t make a big deal about the impending bedtime. Number one, hands down. Look, anyone with a stubborn, strong-willed kid will tell you that the second you start telling them they have to do something, they turn screaming in the opposite direction – sometimes literally. Making a big deal about bedtime is basically telling your stubborn kiddo that now is the time to argue and fight for their right to party. In my experience, starting the ‘bedtime routine’ without even mentioning bedtime helps to sidetrack Ryan just enough for him to cooperate and start to wind down. Turn off the TV, take away screens, whatever. There is science saying that staring at screens like tablets or TV tricks our brains into thinking that it’s daytime, so turn ’em off. I give Ryan his tablet while Owen takes his second nap, after lunch but before dinner so I don’t have that problem, but he does watch TV while I get Owen to sleep. I usually distract him with a snack and then turn it off. While you’re at it, if he’s distracted, take your kiddos loud and obnoxious toys away and hide them. It’s just another thing to catch their attention and wind them up. Clean up and soothing scents. On bath nights, I try to keep it as soothing and low-key as possible. No crazy toys and soothing smells. 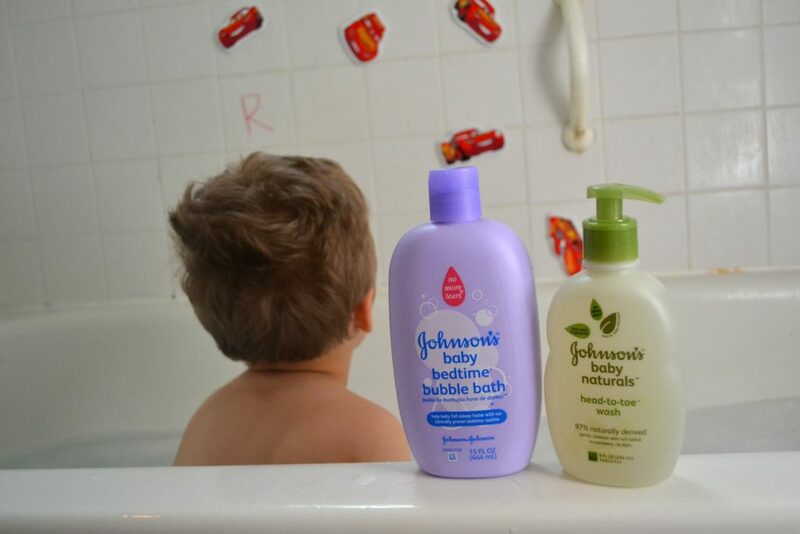 I love to treat Ryan to a bubble bath because he thinks it’s the most thing ever, and I always use Johnson and Johnson bubble bath since it’s what I used as a kid and the lavender smell is calming – I’ll take what help I can get! To wash his hair and body, I recently found Johnson and Johnson Naturals which is such a relief – the wash I had been using previously was seriously 4 or 5 times the price and the quality is the same. As a kid, my mom always used Johnson and Johnson Lavender Scented Sleepytime Lotion. The scent is still so calming to me and I love to use it on my own boy’s perpetually dry skin at night to create an association with the scent to being tired. Plus, there is nothing sweeter in life than tired little boys smelling of lavender baby lotion. Nothing. 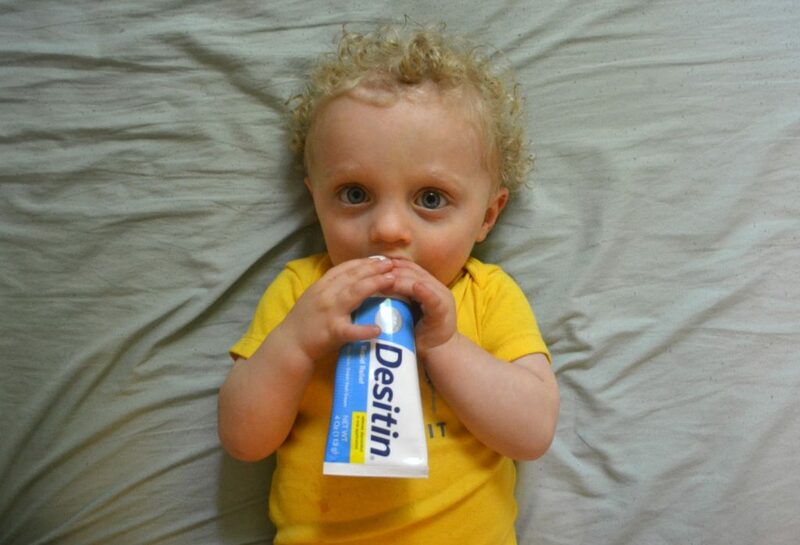 I grab all of my Johnson and Johnson (+Desitin – the only diaper rash cream that works on Owen’s constant cycle of diaper rash!) on iherb.com – I can find everything I need for the boys plus my house and healthy snacks (because snacks, guys) in one spot. If you have a health-conscious family and haven’t checked out iherb yet – you need to. Psssst – use my link and you’ll get 5% off your first order! Have cues words for bed. When it’s time for actual bedtime, I tell him the same thing every night. “Go find your car book and pick out your car!” It’s my way of saying, “Time for bed!” without actually saying it. Sneaky. 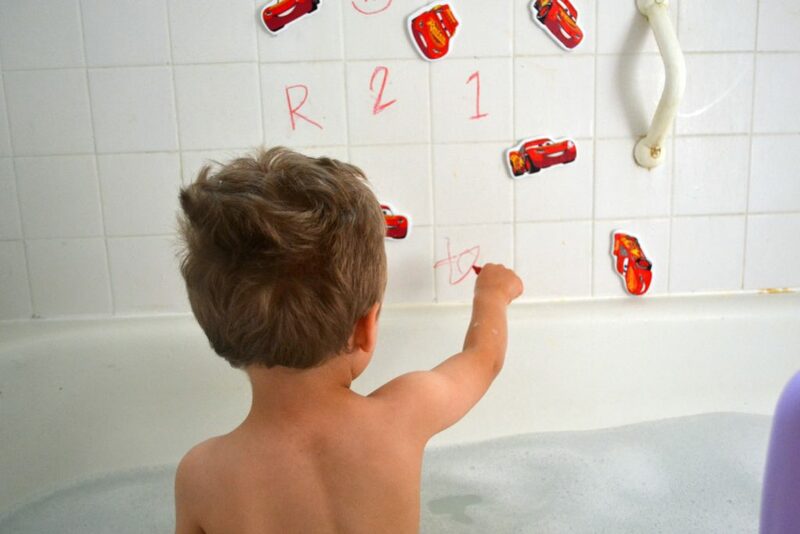 His car book is the equivalent of other children’s security blankets (no surprise there) and he knows the rules for picking out a car (must be small, soundless, and only one) so there is comfort and freedom in making the choice, while still having reasonable restrictions. Although I don’t outright say it is time to get into his bed, more often than not he ends up grabbing his things and getting his booty into bed after that. Want a surefire way to get your kids interested in bedtime? Get them involved! I have Ryan pick out which pajamas he wants, pick out his night time book, and choose which toy he wants to bring to bed. I think giving him a hand in the whole process makes him feel like he’s not being forced into it. On the same page, if I’m reading Ryan a book and he’s not into it, wants to hold the book, whatever, I don’t push it. I’m doing things like that for him so forcing it is counter-intuitive. 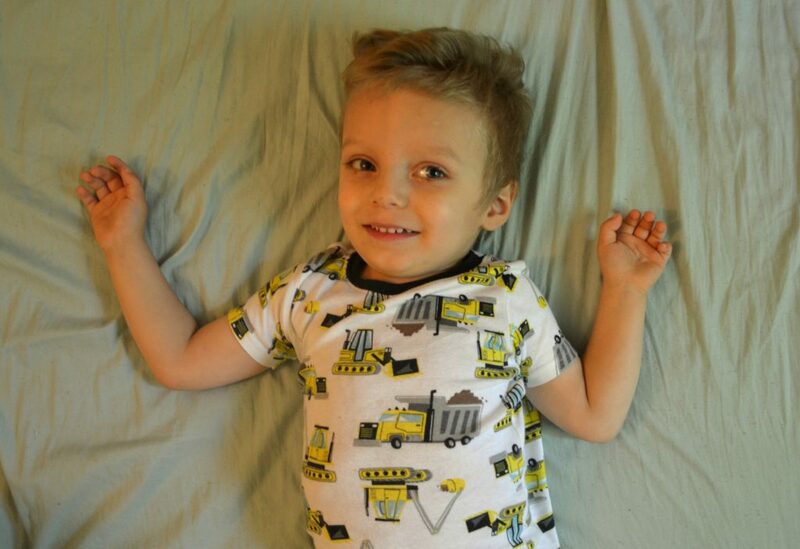 Same goes for choosing him PJ’s or night time car. If he won’t, that’s his loss. Every night is not a walk in the park. Some nights Ryan asks for more books – sometimes he starts asking for food or another bathroom trip. Be firm! If you said one book, it’s one book – period. If he started asking for food every night, try giving a snack before starting your bedtime routine. Limit nighttime water and if your kid isn’t fully potty trained, use a nighttime training underwear. The second you start giving into your kids’ demands, you’re opening up the door for nightly arguments about everything. At the end of the day, getting stubborn kids to bed is never easy. While creating a bedtime routine isn’t ideal for every family, creating a lax, low-key bedtime routine can help get your kiddos into gear without igniting their need to rebel. Okay, so tell me – how do you structure your bedtime routine? Do you have little rebels? Let me know in the comments!